Even the messier fleeces look good. I never got sheep coats on the ewe lambs and with feeding out the hay in the bunkers, the taller girls eat over the backs of the shorter ones, and they get a lot of hay on their backs. Our Coopworth and Border Leicester cross girls have such open fleece structures that most of the veggie matter shakes out, and the rest comes out in the picker. So hopefully we will be getting back some gorgeous roving and yarn from the processor soon. The weather has gotten screamingly cold and we are keeping our newly naked girls in the greenhouse for now. 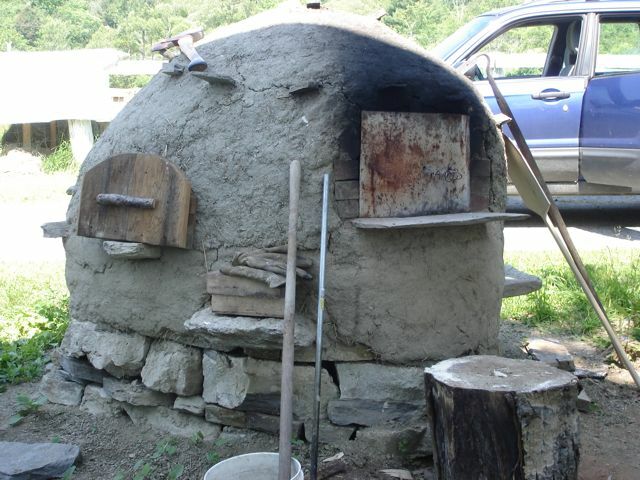 I do need to get some coats on them sometime this week while I have the opportunity to work with them in the daylight. I am on my school winter break, and of course I am sick. I just can’t win! 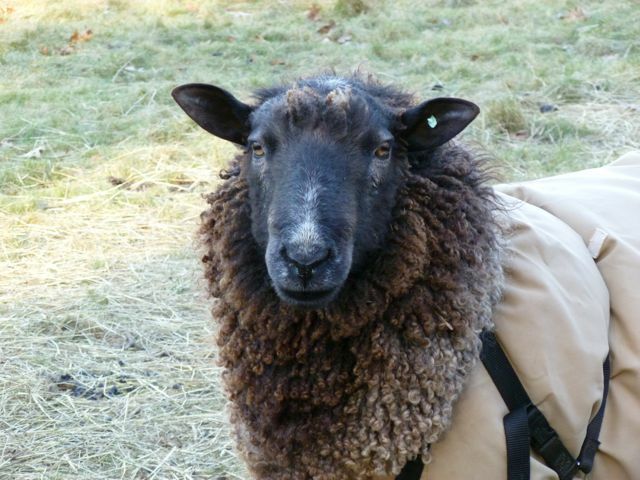 Just a few photos of the wonderful ram, Lucky, who helped us with our breeding this autumn. He is a Border Leicester/Coopworth cross. 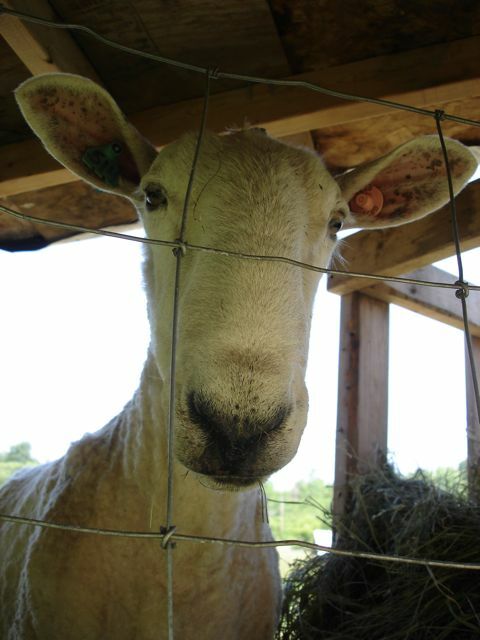 (His father was our first BL ram, Mr. Fright, and his mother was one of our first Coopworth ewes, Tess). 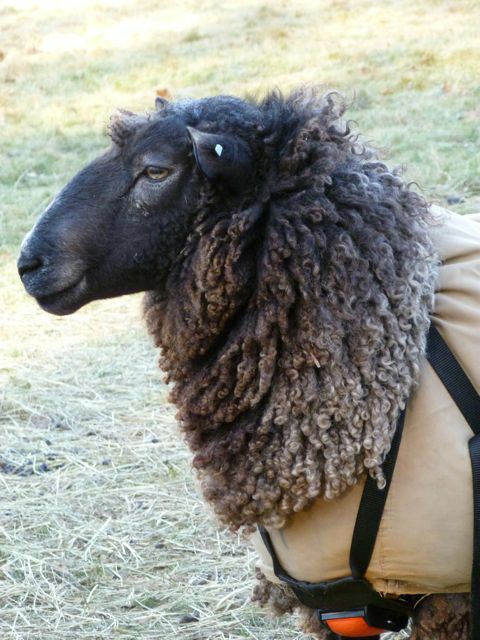 Just an all around hunky guy, with a big, gorgeous fleece. 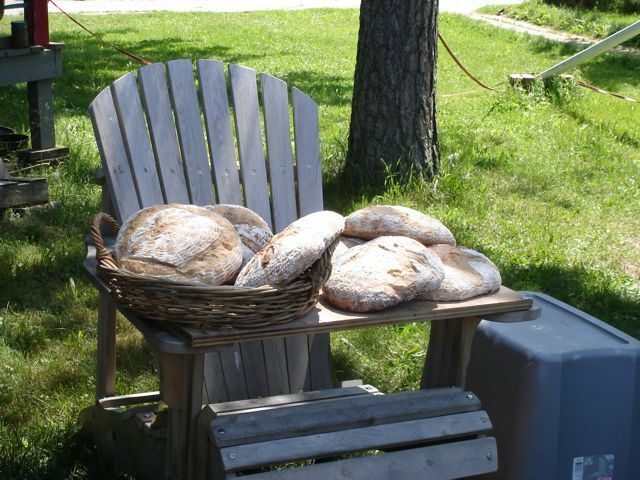 I am looking forward to some of the little Mr. Luckys to come! Persimmon's ram lambs arrive on a sunny afternoon! Persimmon chose a beautiful afternoon on which to deliver her twins, at least a 50 degree day. They are beautiful boys. She of the vaginal prolapse did an amazing job, and the prolapse seems to be a non-issue now as many people had said it might be. I was checking on her on and off all day, but about 3 o’clock I stopped up and saw that she was again in the far back corner of the greenhouse, pawing the ground. When I went in I saw that she had a water bag out and even though it was tough to really check her hind end, I did spy one little hoof. It took me a few minutes to pen her in there and then she wouldn’t let me touch her, but the harness really had to come off or she might not have been able to push the lambs out. I didn’t want to start poking around trying to see if the lamb had both front feet presented (normal delivery) without my lambing box, so by the time I got back, white ram had joined the party and Persimmon was happily chortling to him and cleaning him up. I had hoped that if I turned my back she would do her thing, and thankfully she did. I hate to start the lambing season with a big complicated deal! Of course, she dropped him in the only area of the pen that didn’t have any straw on the floor! I barely had time to get into the pen when Persimmon went into her corner and didn’t even lie down to have black lamb #2. He came out kicking and screaming, and was up fairly quickly. We had some trouble getting them onto the teat, but later on our friend Pam came by and (if I had had my bifocals on I probably would have seen it!) saw that the white ram had entropion, or turned under eyelids. Really irritating to the eye (it actually ulcerates it), so after numerous attempts to turn it right-side-out, this evening I went out and put an alligator clip on the lower lid. It looks awful, but when it creates scar tissue, it should hold the lower lid out and prevent it from turning under again, we hope. We have had pretty good results in the past with that. I think the poor little guy may have been hanging out knocking on the back door for awhile and was squeezing his eyes so tightly that the lower lids rolled under. Poor baby! 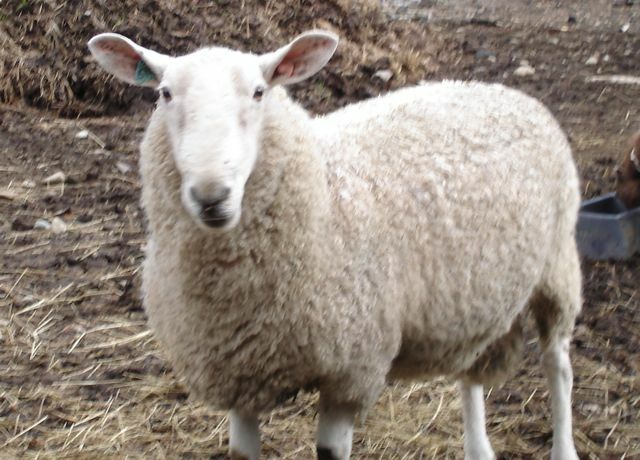 Persimmon is a crossbred ewe, half Border Leicester and half Coopworth. That’s why the boys look like they have bunny ears :*) The twins’ father is Mr. Big, our AI Border Leicester ram who originates from SuDan Farm in Canby, Oregon. Proud father, Mr. Big the BL ram! He always makes beautiful babies! Zach the Ram Lives On! I finally think that we will have a few days’ break from lambing now. After last Sunday’s early morning twins we had an early flurry… seven lambs so far. 4 rams and 3 ewes. My happiest moment came early on Tuesday morning when I arrived in the greenhouse at 5 a.m. to do chores and found that our first time mom, Lupine (a white Border Leicester X Coopworth cross) was lying with an enormous, black, wet and slimy ewe lamb behind her. She looked all done in, and hadn’t gotten up yet. I think I just missed the delivery, which was probably a good thing since I think it must have been a doozy. The ewe lamb had bloodshot eyes, which means that she was really tightly squeezed for a long time on her way out. For a 15 pound lamb with tall goofy legs, she got up and going remarkably well. Once I realized that she was going to be o.k., we tried to get her nursing. Jugged and snuggling with her mama, I did all my other chores and got back to find that she still wasn’t nursing yet. It was already an hour and a half after her birth and I was beginning to get anxious… about ready to tube her when we got her onto the teat and full. It’s always a very anxious time for me, since I do have to go off to work and do not like to leave before I know everything is proceeding normally. I was worried enough about her that when I went off to work I asked our friend Pam from Hatchtown Farm to look in on Lupine and her girl. Well, we have most of the lambs on the ground now. The weekend was quite eventful, with both Raven and Maggie having single lambs. 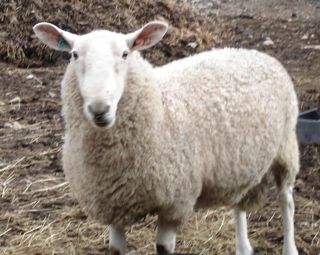 Both were large; Maggie has a beautiful white ewe (with beige ear tips!) and Raven has a black ram. Both have joined the outside group and are enjoying the slightly warmer weather. Norma finally had her lambs on Monday night. They presented a little problem… having such long legs they were a bit tangled, but they hit the ground running. 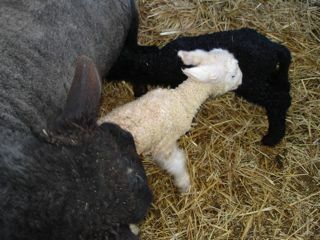 Two black ewes… one with upright, Border Leicester ears, and the other with the sideways Coopworth ears! 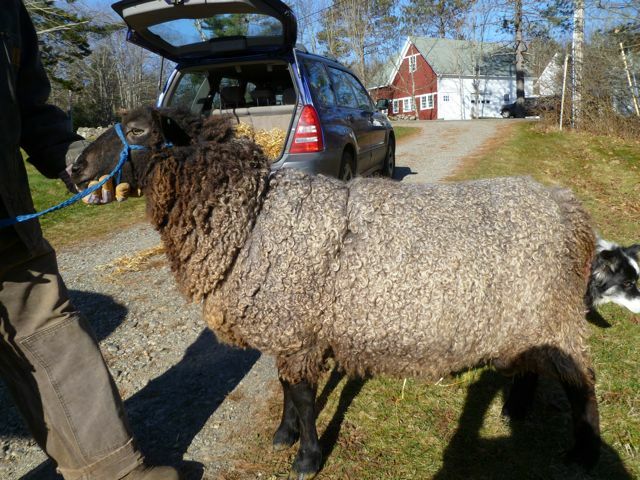 Their father is our newest ram, a black Border Leicester named Zach, who hails from Wit’s End Farm in Virginia. To add to the week, spring may actually be on the horizon. Our twice weekly storms are turning more to rain than snow, finally! Most of the snow in the paddocks and on the ground is disappearing, the robins are hopping around and the bald eagles are soaring over the beaver pond again. Yay!